DSAOC’s Ballet Class – Sunshine, Lollipops and Rainbows! For several months now, Paige Peplow, DSAOC’s Ballet Class instructor, has been working with a great group of young girls on their dance routine to prepare them for their big day: The Ballet Recital. It was all about “Sunshine, Lollipops and Rainbows” in late June when the girls got dressed up in their colorful costumes, did their stretches and prepared to WOW the audience with their talents. With oversized lollipops in their hands and the colors of the rainbow displayed all around them, they won over the hearts of the audience with their performance. Congratulations Paige, and all the girls in the Ballet program, for another wonderful recital! 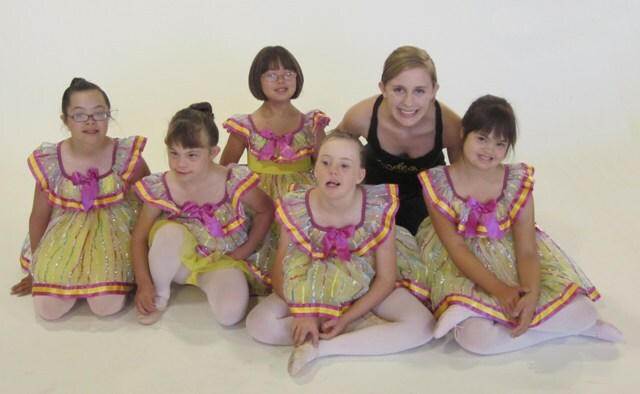 Posted in Uncategorized | Comments Off on DSAOC’s Ballet Class – Sunshine, Lollipops and Rainbows! This wonderful website has been created to celebrate the 40th anniversary of the establishment of the Down Syndrome Program at the University of Washington College of Education. Explore and contribute to the site and see where programs we are very familiar with have come from, and the pioneering work of Dmitriev and Oelwein. People with Down syndrome being avid readers was no accident! Friday, July 29 from 9 a.m. – 4 p.m. in Anaheim. DSAOC is providing this information as a resource to our families. This is a non-DSAOC sponsored event. “Extra” Lifechanger and Hollywood A-lister Sharon Stone, raised $100K for the National Down Syndrome Society at the organization’s 2011 Spring Luncheon in NYC.